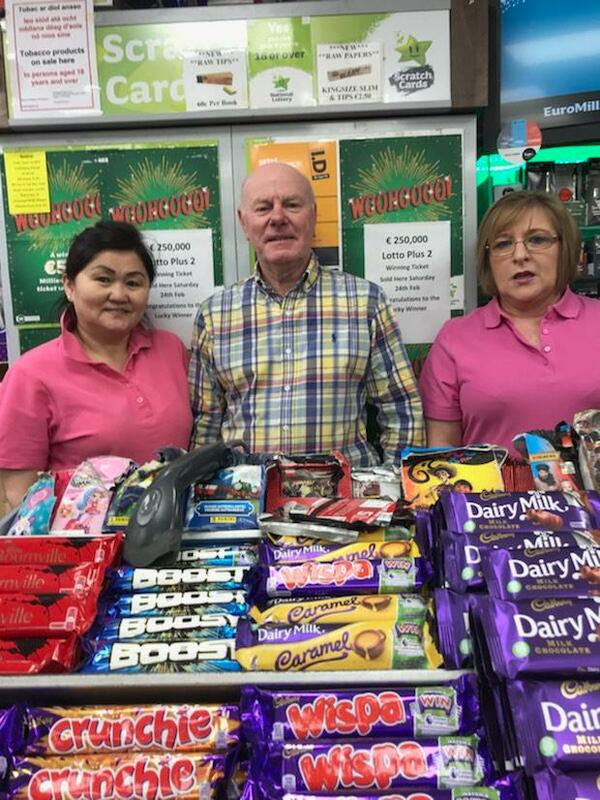 Store owner of Centrepoint Newsagent, Joe Sweeney (centre) celebrates with staff after selling a winning Lotto Plus 2 top prize winning ticket worth €250,000. The winning Lotto Plus 2 ticket was sold at Centrepoint Newsagents in the Donaghmede Shopping Centre in Dublin 13. The owner of CentrePoint Newsagents, Joe Sweeney, said he was delighted with the win, particularly as the majority of his customers are from the north Dublin locality. “This is a brilliant win for the people of Donaghmede,” Mr Sweeney said yesterday. “It’s been a crazy morning in the shop as news of the massive win filtered through the community. People have been flocking to the store after Mass to check their tickets in the hope that they might have won the big prize. Mr Sweeney also revealed that it is the not the first time that the shop has struck lucky when it comes to Lotto wins. “We have been quite a lucky shop in the past with some big EuroMillions and Christmas Millionaire Raffle prizes but nothing on this scale. “We’re going to be celebrating for a long time. We encourage anybody in the area to pop into the shop today to check their tickets and to enjoy the celebrations with our staff,” he added. There was no winner of the €2 million Lotto jackpot but among the 63,000 winners in Saturday’s Lotto draws were two players from Cork and Dublin who matched the Match 5 + Bonus prize of €60,174. The winning player from Cork purchased their Quick Pick ticket on the day of the draw at the Bookstation in Blackpool Shopping Centre. The other lucky Dublin player bought their Normal Play ticket at the DNS Convenience Store on the Ballybough Road in Dublin 3 also on the day of the draw. The National Lottery is encouraging all its players to check their Lotto tickets. A spokesperson said: “It has been a bumper weekend of prizes for our players across EuroMillions and Lotto. If you do happen to be one of those two lucky ticketholders, be sure to sign the back of the ticket and contact our prize claims team on 01 836 4444 and we will make arrangements for you to come to the National Lottery to get your prize”. The exciting news came during a good week for Lotto wins after someone scooped the €7m midweek Lotto jackpot with the winning ticket sold online. And in Dublin, there was more success in recent days with a player claiming €1m in the Daily Millions draw.